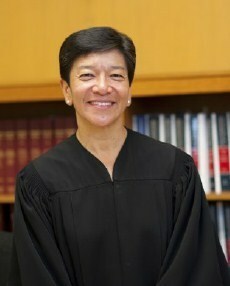 Justice Mary Yu, ’93 J.D. Growing up in Chicago’s Bridgeport neighborhood, an area historically inhabited by working class Irish immigrants, Mary Yu, ’93 J.D., wasn’t afforded the opportunity of seeing many people who looked like her in positions of power or significant influence, she told Notre Dame Law students this week. The daughter of a Mexican farm worker and Chinese factory employee, Yu was born at a time when minorities and women were completely devoid on high court judge rosters. After 10 years of working for the Office of Peace and Justice for the Archdiocese of Chicago, and more than 14 years as a trial court judge, Yu was appointed the state of Washington’s first Chinese, Latina and openly gay Supreme Court Justice. Today, as she meets with young people, she said, she can’t help but make sure she is setting an example, particularly for women of color. “I’m aware of, in a very acute way, what it means for kids to see me,” Justice Yu explained to a classroom full of first, second and third year Notre Dame Law students. “That’s been new since I’ve been a judge and then on the Supreme Court. Kids need to see themselves in others. Justice Yu’s presence in the large lecture hall evoked a spirit of confidence and compassion, students said. Miracle Haynes, 2L, came to hear the Justice’s insight on clerkships but walked away impressed with her position on humility and kindness. “Her point about being interested in people really demonstrates her commitment to service,” Haynes said. Like many NDLS alumni, Justice Yu credits her success to God, Country and Notre Dame. Originally published by Lauren Love at law.nd.edu on September 23, 2015.